"Japanese aircraft were not designed to meet requirements of specific airplanes but instead, the aircraft were modified to suit the torpedo." Much attention has been paid in previous posts to the discussion of aircraft and associated engine and armament development, but no consideration has been given to the development of aircraft torpedoes. This is unfortunate because, as identified, an entire line of naval aircraft is devoted to their use. This post will provide a summary of torpedo development with emphasis on technical limitations in order to help characterize or imagine the function of Japanese torpedo bombers in relation to other aircraft in game. * the maximum speed at which the torpedo can hit the water without breaking up. The typical torpedo drop is performed at 330 feet (100.6 m) and 180 knots (333.4 km/h) to achieve entry angle of 17-20 degrees. -- The maximum drop altitude is about 1000 feet (305 m). -- The minimum drop altitude is about 50 feet (15.2 m). 2) stealth mechanics -- reduction in visibility due to camouflage, night time, radar obfuscation, etc. The H.M.S. Prince of Wales was sunk by 7 Type 91's (Mod 1 and 4), and the H.M.S. Repulse was sunk by 17 of the same. ... this just means that multiple torpedo bombers are necessary to sink a battleship, further emphasizing the need for air superiority or support. -- At that speed a maximum range of 2012 meters is reached in 1.54 minutes (92.4 sec). -- At that speed a maximum range of 1500 meters is reached in 1.15 minutes (69 sec). ... This means that if you succeed at launching a torpedo moments before you die in-game, you'll have to wait at most 92 seconds before getting the results; this in turn suggests that some form of camera tracking of the torpedo (such as after death) might be favorable. -- If proper depth is desirable in all cases, then the minimum range can be considered to be equal to 348 meters. -- At the standard speed this means 0.27 minutes (16.2 sec) to achieve proper depth. ... Given that there is a 1664 meter "window of opportunity" (2012 m - 348 m) for torpedo deployment , and given the previous conditions for deployment, this suggests that a helpful HUD element would be one that accounts for range, altitude, speed; or perhaps a voiceover that advises you to drop altitude, drop speed, etc. A tutorial might also be appropriate. -- Type 91 Mod 1 was used up to and including the Nakajima B5N. -- The transition to Type 91 Mod 2 probably occurred with the B5N1. -- It can be reasonably assumed that the transition from Type 91 Mod 3 Improved to Mod 3 Strong occurs with the Aichi B7A2 because the maximum speed of the B7A2 (567 km/h in level flight) exceeds the capability of the Mod 3 Improved (which experiences loss of durability if water entry >556 km/h). The B7A2 was planned for a new generation of carriers but were ultimately allotted to land-based units. The B7A3 was projected but the torpedo bomber function was ultimately replaced by more capable land-based units such as the twin-engine Ki-67 and P1Y. The Ki-67 could be included above (IJA counterpart to IJN's P1Y) because it served as a torpedo bomber for both IJA and IJN. -- The Mod 3 Strong, Mod 4 Strong, and Mod 7 Strong developments (allowing greater deployment velocity) make sense given that Ki-67 and P1Y lack dive brakes (unlike the previous B-series of aircraft). -- The Type 4 was essentially a Type 91 modified to ease production and does not appear to correlate to any particular aircraft. Lack of air superiority necessitated an improvement to standoff distance and therefore it can be argued that 'torpedo' development continued sequentially by the way of glide bombs and the Ohka/Baika human-guided jet-powered bombs. The Army instead developed radio-guided bombs (I-Go), trialed on Ki-48 but meant ultimately for the Ki-102b. -- speed has been reduced from 42 knots to 35 knots (-16.7%). Edited by J311yfish, 25 May 2016 - 07:02 PM. Problem 1: N1K5-A to A7M1 sequence is not correct. -- Mitsubishi A8M, Nakajima C6N1-B, and Aichi B8A Mokusei have been substantiated by Francillon, Dyer, or both, though not in any great detail. "Wakusei" on the other hand uses the internet as a secondary source, and the primary source ("recent Maru magazine") has not been verified. Edited by J311yfish, 27 May 2016 - 10:58 PM. The changes had been done for quite some time now...it got rid of the biplane tier that people complain about so much...in comparison, the US gets straight to F4F at tier 5 (after the F3F in tier 4), then to F6F, then F4U, and finally stops at F8F. This also rid the carriers of jet planes (F2H Banshee/Kikka, and even the J7W1 Shinden, which was planned to be converted into jet). It's not like WoWS needs to care about that kind of detail...you can just slap numbers on planes and they'll work. It's not like having machine guns only is handicapping in firepower for the US nor having cannons offering firepower advantage to the Japanese. Besides, people does not really go there for planes, anyway. Edited by pyantoryng, 26 May 2016 - 06:50 PM. This post is reserved for minor updates and edits such as information that cannot be added to the main data due to forum constraints (Ex: size/format). The goal will be of course to limit the size of the addendum to only extremely relevant information that might not otherwise get to be included in the original/appropriate place. Nakajima B6N Tenzan -- some of the information for this aircraft is not entirely correct, and could be far more comprehensive, especially as it relates to development leading to Nakajima Kikka. The definitive source in English is not Francillon but rather Wieliczko. Due to forum constraints on post sizes, and due to time constraints, I am going to leave this information as it is, and will only update it if it becomes apparent that IJN torpedo bombers are to be included in game. Edited by J311yfish, 08 July 2016 - 06:09 PM. If true, then it is interesting to note that they chose the fictional Tachikawa Ki-162 over the actual Nakajima Kikka, Kugisho R2Y2, Nakajima Ki-201, and Rikugun Ki-200/202, presumably because it helps to maintain a consistent theme. 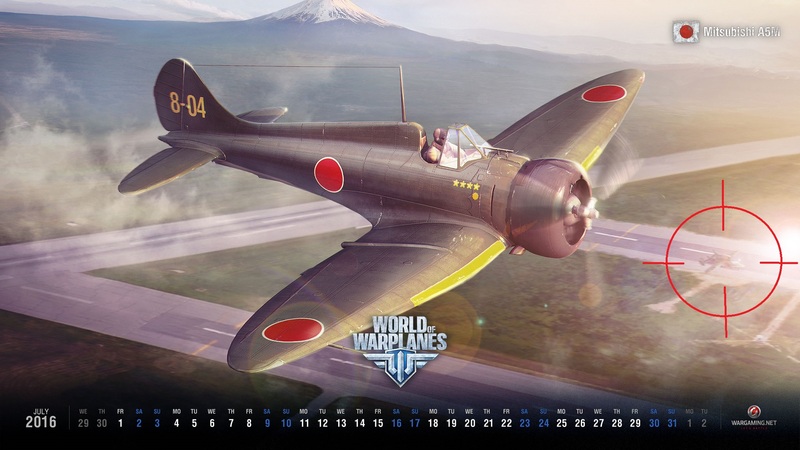 Also interesting that Japan gets Ki-162 before Germany gets Heinkel He 162. 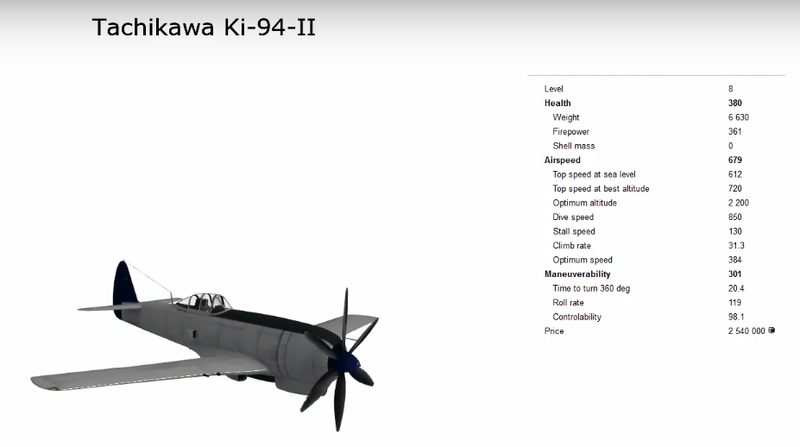 IJA aircraft baseline specs/models leaked via Russian youtube video. Added comparison to max-spec aircraft of same tier. Edited by J311yfish, 17 July 2016 - 10:55 PM. I was kinda hoping to see if they were going to put any japanese heavies in. spotted by Pentakon on EU forum, image presumably modified by Pentakon. Edited by J311yfish, 06 July 2016 - 01:26 PM. After the IJA line is released, and modules are made public, it should be easier to confirm placement of aircraft at all tiers. Edited by J311yfish, 06 July 2016 - 01:46 PM. wait is this the planned tech tree for japan? All else is speculative in nature based on the works of Francillon, Dyer, Mikesh, Bueschel, and others. Edited by J311yfish, 07 July 2016 - 12:58 AM. All I have to say is wow - the amount of information and research here in this thread is awesome. Thanks so much for your efforts and the others that contributed!! I can wait! I think I am turning Japanese, turning Japanese - I really think so! Edited by Caecias, 07 July 2016 - 06:15 PM. Those are some beautiful planes, had to look some up. Happy to finally see the Oscar in the tech tree. -- Ki-61 progression does not include the Ki-100 radial-engine adaptation. Also, a 4x20mm variant (Ki-61-IIb) has not been added --> possible premium. Edited by J311yfish, 17 July 2016 - 01:37 PM. Ki-43 I can be exclusively armed with cannons by tier 4...I don't recall any tech tree planes at tier 4 being armed exclusively with cannons up to this point. Top level gun is available already at tier 9 not unlike the existing IJN line...uses the same jets as J7W2. The whole line never gets more than two 30mms. Ho 155-I = basic model, too big to fit into wing mounts, available as cowling mount for tier 9 stock. Edited by pyantoryng, 12 July 2016 - 11:39 AM. I'm excited by this. I just recently discovered the game and I'm glad they're making the effort to put this into play. Thanks again for passing the information along.